Forming a new company in Hong Kong can be done in one of several different ways. The most common two types of businesses foreign investors start in Hong Kong are limited companies and registered offices. Both have their uses and challenges. A limited company can conduct many different types of business and can earn a profit, while a registered office cannot. However, a limited company must have a director living in Hong Kong and have a registered address in the city that acts as that company’s official place of business. It is possible that most of the directors of your business will not live in Hong Kong. In fact, you may have only one Hong Kong native who serves as a director and as your company secretary. If that is the case, you may not even need a true office. Your single native director may work from home. However, in order to be a legal business, your company must have a business address. Renting office space can be expensive, especially if you don’t really need that space regularly. It may be an expense you do not or cannot add to your budget. That is when a virtual office comes in handy. A virtual office is a service other businesses can hire to avoid renting or purchasing their own place of business. The monthly cost for this service is usually much lower than the cost of renting your own office, especially if you only need the most basic services. Virtual offices come with a number of additional options that you can add to your office as needed. In some cases, you may not need any of these add on options, while in other cases, you may need them on a regular basis. The main function of a virtual office is to provide your company with a permanent business address in Hong Kong. Many companies that offer these services have multiple addresses, so you can select the one in the area you feel like your business would best fit. Most of these addresses are based in business districts or other influential areas. This can give your company the prestige of being located in a prime area, even though it is really not. Most virtual offices also come with some limited secretarial services. These assistants will collect mail and sign for packages that are sent to your virtual address. They may also act as an answering service. They may take messages and pass them on to you, plus some companies’ assistants provide free call forwarding. If you get a call during your stated business hours, the assistant forwards it to the number of your choice. Some offices offer this service at an additional cost, though. These offices are more than just an address. They are a fully functioning business centre with offices and meeting rooms. You can reserve these rooms if they are available, giving you a physical location to meet with clients or hold board meetings. Many virtual offices include reserving these spaces in your fee, so there’s no reason not to make use of them. Virtual offices have many other functions in addition to those listed above. Some of these functions are also included in your standard monthly rate, while others cost extra. It varies from company to company, but most do offer you the option to customise your office. You can add in features you know you will use on a regular basis or remove those that you know you will not need. Most include computers, printers, fax machines, and other office equipment you or your team members can come in and use as needed. The administrative assistants at your virtual office may be able to help you with tasks such as copying documents, filing, and doing other light secretarial work. There are also usually enough people to cover the phones during lunch, and some may even work evening shifts to provide more assistance. Modular workspaces that can be arranged however you need them. 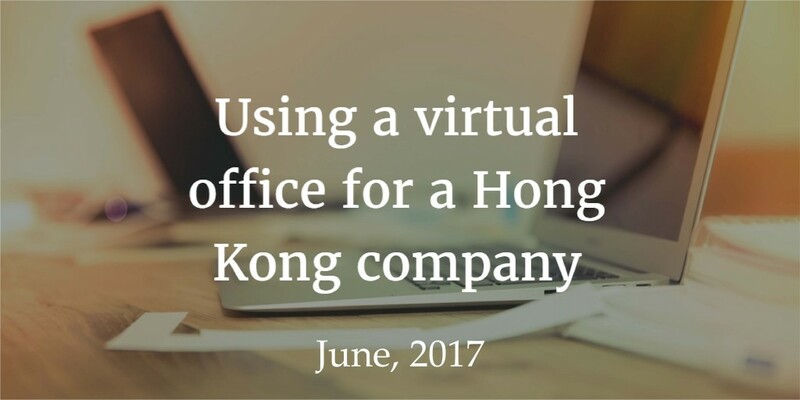 Besides providing your company with an official address as required to operate in Hong Kong, making use of a virtual office has a number of other benefits. Your staff can work from wherever they want to rather than always going into the office. This allows them to work in an environment where they are more comfortable and can be more productive. They can also work more flexible hours in most cases, allowing them to attend their children’s functions and other events. Commuting to work takes up time that is really not beneficial to anyone. By working remotely, your employees save that time. This means they can usually sleep in later, allowing them to wake up feeling more refreshed. This makes them both more productive and can help improve their health. Your team also does not have to feel as rushed to get to the office to clock in or as tied to the clock and their desk as they might otherwise feel. Your team can be located anywhere in the world. While that is true with a main office as well, with a virtual office, it puts everyone on a more equal footing. No one will feel like they are missing out on office banter or on a tighter relationship with their co-workers just because they telecommute to work. Instead, everyone telecommutes, which can help bring your staff, whether they are located in Hong Kong or not, closer together. You are not only saving money on leasing business space, you are also saving money in many other ways. You don’t have to pay any office utilities or purchase an insurance policy that covers your place of business. You don’t need to buy any office furniture, either, nor do you need to buy computers, printers, and other office equipment. These savings are substantial, and in many cases, being able to avoid these expenses can provide your new company with a much larger amount of start-up capital. Does a Virtual Office Make Sense? If you are starting up a business in Hong Kong as a foreign investor, a virtual office makes the most sense for you. Look for an office that offers everything you need and discuss customising a package to cover your needs.